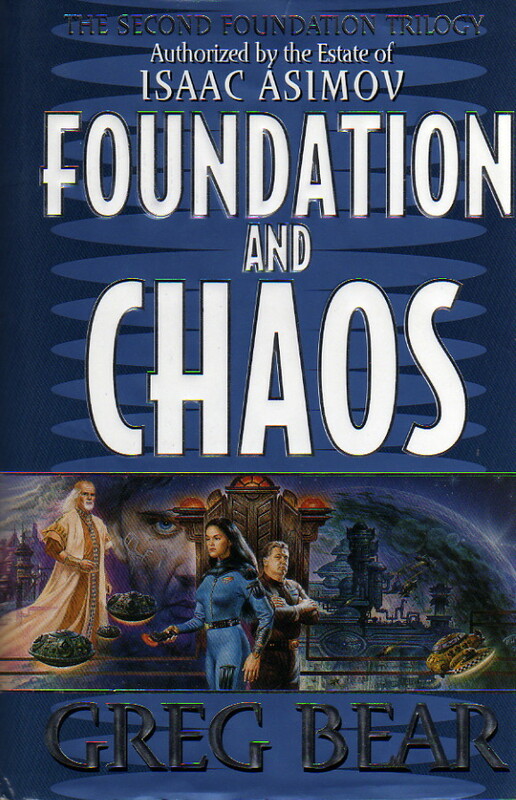 The action of Foundation and Chaos actually takes place within the action of Forward the Foundation (specifically between Part IV [“Wanda Seldon”] and Part V [“Epilogue”]) and that of Foundation. Hari Seldon is old now, and his life’s work is drawing to a close. His arranged trial for treason, which will exile the Encyclopedists to Terminus, is fast approaching; Gaal Dornick is about to arrive on Trantor; it’s almost time to start recording his messages for the Time Vault. Seldon is not, however, the only one who appreciates the importance of events over the coming weeks. R. Daneel Olivaw is still working behind the scenes, manipulating Seldon and others to bring his own stewardship over humanity to a close. Other robots are questioning Daneel and opposing his methods and goals, including Lodovik Trema. Trema was once a trusted lieutenant to Daneel, but a botched hyperspace Jump exposed him to a neutrino storm and seems to have altered his basic programming—indeed, to have erased the Three Laws from his positronic brain. Seldon has become the focus of their opposition. And Palace intrigues continue. Linge Chen has the power but not the name of Emperor, but trying to take his place as the power behind the throne is Farad Sinter who ingratiated himself to the young Emperor Klayus I by acting as his pimp. Sinter is obsessed with the idea that legends of robot meddling in human affairs have a basis in fact. He has, moreover, discovered a young woman named Vara Liso. She has incredible mental powers and tells wild stories of a conspiracy of mentalists—Seldon’s Second Foundation, from whom she is a renegade. Indeed, Vara Liso is not the only mentalist with astonishing power to surface. A young Dahlite girl, Klia Asgar, finds herself driven from her existence as a courier in Dahl’s underworld by Imperial troops hunting her down and by a mysterious man in green who claims to have the same powers as she and to represent a group of his “brothers and sisters” who can give her life new meaning. And at the center of the storm is Hari Seldon. He must either be stopped—or left alone, to bring the Foundations into existence. I owe a special debt of gratitude to Greg Bear. School, family, and other concerns in the mid-1980’s kept me from keeping current with sf writing (other than the Good Doctor’s), until I stumbled across a copy of Bear’s Blood Music on the shelf of the lab where I worked. Blood Music was an astonishing bit of work with a vision of humanity’s future worthy of Arthur C. Clarke’s Childhood’s End and rekindled the fire to devour sf in my soul. Bear is also the author of Eon and Eternity which involve the asteroid Thistledown, one of the most mind-boggling artifacts in science fiction this side of Larry Niven’s Ringworld. I was therefore reassured to find out that he would be one of the three authors working on the Second Foundation Trilogy and came to this book already prejudiced in its favor. What caught me utterly by surprise, however, is just how good a job Bear does. This book fits marvelously into Asimov’s Foundation stories with almost invisible seams. It’s also a “page-turner” in the best Asimovian tradition. The only things that kept me reading it straight through at a single sitting were my three-year-old daughter (a force not to be trifled with who has a habit of taking books out of Daddy’s hands and throwing them across the room) and the constant need to dash to my bookshelves and confirm a casual allusion to one of Asimov’s other stories. A lot of Asimov fans were disappointed by Gregory Benford’s Foundation’s Fear because Benford did not particularly aim at maintaining conceptual consistency with Asimov’s work. Benford was more interested in looking at some of the conceptual gaps in Asimov’s universe and filling them in. Personally, I appreciate the validity of Benford’s methodology and enjoyed the book as a result. Bear’s taken the opposite approach and actually succeeded at it. Until the very end, there are very few aspects of the book which do not work well with Asimov’s writing. Even then, Bear doesn’t do much worse than the Good Doctor himself (witness the inconsistent dating of the Galatcic Empire in our Common Era, or the reasons why the Earth goes radioactive). His ability to tie in loose ends from Asimov’s work is astonishing, and it was a major relief to be back in a universe where hyperspatial Jumps formed the basis for interstellar transport and where the air is charged with electricity from blaster bolts and neuronic whip discharges. And as an added plus, Bear actually takes us through Hari Seldon’s trial from “The Psychohistorians” in Foundation almost word-for-word—but from another point of view. Nor does Bear avoid looking at ways to expand Asimov’s conceptual universe. Fundamental is the idea of a cadre of robots opposed to R. Daneel and his way of running human history. I myself haven’t always been sanguine with the concept of a robot commandeering human history and enjoyed seeing this theme discussed. The history of Lodovic Trema, a robot who has lost the Three Laws and therefore his moral bearings, is handled sensitively and well. And the idea of a renegade Second Foundationer is a good one, too, and Vara Liso is an interesting character. One measure of how good a science fiction book is, is its ability to function as escapism, a sort of psychological vacation. Do we want to vanish into this world? Do we want to interact with these characters and share their adventures? Bear succeeds admirably on this level. Another way of evaluating the book’s quality is how well Bear makes us forget that we already know the ending when we start the book. Of course Seldon’s going to win out and start the two Foundations. The original Trilogy tells us that much. And of course Daneel’s going to win out over robotic opposition. Otherwise we wouldn’t find him camped out on the Moon in Foundation and Earth. Bear succeeds admirably on this level, too, building suspsense over how the crisis he brings about will be resolved. I would really rank this book very high, right below the original Trilogy and Forward the Foundation, above Prelude to Foundation, Foundation’s Edge, and well above Foundation and Earth. It’s that good. So is it perfect? Well, no. Ironically, one of the things that Benford did best was reveal the psychological history and development of Asimov’s characters. Bear’s characterizations are weak by comparison and I really don’t feel like I know Hari Seldon as a character better than I did before. In particular, the Joan of Arc sim from Foundation’s Fear (who resurfaces along with Voltaire) I found even less convincing than I had in Benford’s book. The narrative also is hard to follow in spots as Bear is spinning a good half-dozen threads simultaneously. He does manage to keep things pretty straight, but it’s still jarring for the reader to have to switch gears every five to ten pages. There are some missed opportunities for tie-ins with Asimov’s books (notably a couple of spots when Pebble in the Sky could have been alluded to), but that’s a very minor quibble considering all the allusions Bear hit. The book’s worst flaw in my eyes is that the ending doesn’t quite live up to the promise of the beginning. As with Benford’s book, I was left unconvinced that the characters would be able to “walk away” from the situations in the story the way they did, and the ending ultimately involves some very serious contradictions with Forward the Foundation and, more seriously, Second Foundation itself. Bottom line: This is a top-notch book, a must-read for any Asimov fan. Bear manages to expand the Foundation universe and tell a story worthy of the Good Doctor himself. It’s worth buying, even at full hard-cover prices, and compels me to find a place in my Asimov collection for the entire Second Foundation Trilogy.